How an Improved Food Service Creates a Better Life Quality for Elderly People | This is Design Thinking! In autumn 2007 the Danish innovation and design agency Hatch & Bloom was assigned to design a new meal service for The Municipality of Holstebro. Six month later the idea for The Good Kitchen was created. Thus the way was cleared for a new type of meal service in Denmark, a meal service with more quality, more flexibility and more freedom of choice. The Danes, like citizens in most developed countries, recognize that the aging of their population presents many challenges. One of these is serving the more than 125,000 senior citizens who rely on government-sponsored meals. Danish municipalities deliver subsidized meals to people who suffer from a reduced ability to function, due to illness, age, or other conditions. Many of the seniors have nutritional challenges and a poor quality of life because they simply do not eat enough. In fact, it is estimated that 60% of Denmark’s seniors in assisted living facilities or residential care units have poor nutrition, and 20% are actually malnourished. The result is both health problems and a low quality of life for the elderly and a greater economic burden on the government. The problem only looks to intensify as the number of senior citizens grows and future generations of seniors expect greater choice and better service. In response to this growing social problem, the Municipality of Holstebro applied for an innovative program, offered through the Danish Enterprise and Construction Authority, that provides funding to municipalities and facilitates partnerships between those municipalities and Danish design firms. The firm Hatch & Bloom signed on to be part of the effort to improve meal service for seniors. Innovation director Lotte Lyngsted Jepsen led the effort over the next 6 months. As Lotte recalled it, both Holstebro officials and the leaders of the Hospitable Food Service (Holstebro’s meal preparation and delivery organization) saw the project as straightforward at its outset: the current menu just needed some updating. In their view, they already offered high-quality food and service, so the Hatch & Bloom team’s role would be to ask elderly clients about their menu preferences. As the project progressed, however, this view shifted. The result was the design of a wholly new meal service that offered higher quality, more flexibility, and increased choice. This dramatic reframing of the opportunity emerged from the user-centered design approach that Hatch & Bloom brought to the process. We find the ethnographic focus of design thinking to be especially powerful in the social services sector. Despite the best intentions, when leaders of agencies that serve the indigent or the elderly base solutions on their own views of the needs and wants of those clients, the quality of the solutions suffers. We simply cannot be sure that we understand the details of their lives, when we don’t observe and ask. Ethnographic Research: Learning to See What is? The Hatch & Bloom team began by digging deep into seniors’ behaviors, needs and wishes, using a comprehensive ethnographic-based research process that focused on identifying their current situation and unarticulated needs. Team members rode with food service employees who delivered the meals to the elderly clients, accompanied them into the homes and watched as clients prepared the food, added ingredients, set the table, and ate the meal. In addition to observing current customers, they studied those who had discontinued the service as well as people close to retirement age who might soon qualify for the subsidized meals. It was not going to be enough to focus on the needs of the consumers, team members realized; they would need to address the problems of the employees producing the meals as well. The team decided to broaden the scope of the project beyond just improving menus, and helped the government clients to understand why this was necessary. As a result, the Hatch & Bloom researchers also conducted interviews with and observed the kitchen workers, outlining their needs and work processes. From this dual focus—on the people preparing the meals and on the seniors receiving them—a set of interesting findings began to emerge. When we set out to explore an opportunity, we often find that our initial scoping of the issue was flawed. Here a problem that we thought had an obvious solution – whether that be an updated menu or a better search software – actually required the redesign of an entire experience. It’s not easy to reframe an issue or problem. But it can help to think of the initial scope of the project as a hypothesis that you must revisit and refine along the way. Keep in mind – this does not indicate a mistake in our early scoping; it is a sign of important learning. As the research team observed kitchen employees and interviewed them about their jobs, they were surprised to find that one of the workers’ major frustrations was that they were not empowered to do what they loved. They had chosen to work with food because they enjoyed creating things out of food, but they were forced to prepare the same food from the same menu month after month. The decision to use one menu for three months made sense from an operational logistics point of view, but it was terribly corrosive to the morale, motivation, and commitment of the kitchen employees, and, the team learned, it wasn’t good for customers, either. The more the team from Hatch & Bloom got to know the kitchen employees, the more it became apparent that this was a skilled workforce. Public perception and reality were quite different. The workers were making boring, low-cost meals because of perceived economic and logistical constraints, not because they faced a skills gap. The seniors receiving meals also suffered from feelings of disconnection and stigma, the Hatch & Bloom team learned in interviews with them. The social stigma of even having to receive such assistance weighed heavily: Help for cleaning was considered acceptable in Danish culture, but help for more personal needs was much less so. It also mattered who was providing the help. In Denmark a senior hoped to receive it from a relative or a friend. If that was not possible, one would perhaps hire someone. The last resort was to receive assistance from the government. On a more positive note, the team also discovered that this generation of seniors was very responsible and capable in the kitchen and had a keen sense of the seasons and positive associations with seasonal food, such as apples in the fall and strawberries in summer. They also often tried to customize their meals by adding spices or using their own potatoes or vegetables. A lot of the findings in the kitchen actually worked very well with the findings from the users. So, for instance, the fact that it’s incredibly boring to choose from the same menu three months in a row: That’s a typical leader’s decision because it makes logistics easier. You can buy more of the same food at one time, and so forth. But it’s not a chef’s decision, and it’s not a user’s decision, either. Once team members had finished their ethnographic research, they moved to enlist a broader group of stakeholders in understanding the nature of the challenges and participating in creating solutions. The goal was to solicit a wide range of ideas for developing a new and better meal service. To accomplish this, they held a series of three workshops. The first workshop brought together municipality officials, volunteers, experts in elderly issues, kitchen workers, and employees of residential care centers. This group of roughly 25 people gathered for the first daylong workshop to review the ethnographic research and develop insights that would later facilitate the creation of innovative ideas when they transitioned from What is? to What if?. The Hatch & Bloom facilitators began by serving food from the actual kitchen to give participants an experience similar to that of the customers. As Lotte noted, “A lot of the politicians who talk about this food had never eaten it themselves.” The researchers also presented their findings. The purpose of the workshop was strategic: to build awareness of the issue and a shared vantage point as the group proceeded to address it. No solutions were discussed yet. As with ethnography (and for many of the same reasons), co-creation is especially powerful in social service projects. This has to do in large part with the complexity of the stakeholder network. Unlike business, where we often find a single decision maker, social service projects generally involve multiple decision makers, each of whom must support a proposed solution. Enlisting them in the design of solutions is both more effective and even more efficient under these circumstances. The third workshop, which was much more hands-on, moved into the What wows? phase, involving prototyping their co-created solutions and began testing them. For example, Hatch & Bloom worked with participants on three different versions of the menu and asked them which they liked and how they felt about various aspects, such as which colors they favored and whether they preferred photos or illustrations. Hatch & Bloom had invited a well-known chef to observe the kitchen in action and then to attend the workshop. He was surprised, he told the participants, by the kitchen workers’ skills: They were almost at the level of professional chefs. But they had different results he argued, which was because of their different focus, not a lack of skill. As they prepared meals, the kitchen employees concentrated on maximizing economy rather than food styling or seasoning or other aspects that professional chefs would focus on. Being compared with chefs shocked the people who worked in the kitchens. It also boosted their confidence and sparked an increased passion for the project because they were being told that they were actually good at something. Hatch & Bloom took the results from the workshops and moved into What works?, testing prototypes with different combinations and ways of presenting the food with the customers they had been observing since the beginning of the project. As before during their initial exploratory research during What is? , they didn’t test the prototypes only with current customers, but also with people who had stopped using the service and with younger people who were nearing retirement age. The process of ethnographic observation, mind mapping, co-creating with stakeholders, and iterative prototyping and experimentation yielded a host of dramatic changes: a new menu, new uniforms for staff, a new feedback mechanism (we’ll get to that in a bit)—an overall new experience for both customers and employees. Employees’ images of themselves and the services they provided changed, and this itself seemed to improve customer satisfaction levels. Good Kitchen employees also made changes to the menu based on what they heard from seniors. For example, they learned that a lot of their clients were still very social, so they added a two-course guest menu. They also introduced individual snacks, such as pastries and chocolate, to enable seniors to adapt their meals to their lifestyles and behaviours. In addition, at the request of customers and with the assistance of a consulting chef, The Good Kitchen began to offer high-quality additions. Some of these were inspired by the finding that the elderly clients had positive associations with foods that had been available, in their past, only at certain times of the year. The menu emphasized traditional dishes with familiar taste experiences but now included dishes such as “lemon spaghetti with mushrooms and parsley” and “soup with Jerusalem artichokes and grilled cockerel.” There was also a “weekly surprise,” which allowed for more creativity by Good Kitchen employees and greater variety for customers. Employees in the kitchen had not been accustomed to communicating with the people they served (this goes back to the “Who are the waiters?” question). The drivers who delivered the meals, who were all kitchen employees, would enter the seniors’ homes and leave without reflecting on what they saw. So the team developed simple comment cards that drivers began to carry with them and hand to customers, who wrote reviews of their meals and suggestions for how to prepare them. This immediate feedback enabled the staff to gain insights into the seniors’ thoughts and reactions to their food. The comments were read aloud at staff meetings and pinned up in a central kitchen location. The cards motivated employees and gave seniors the ability to influence their meals. Both groups loved the new feedback cards. This direct contact was reinforced with indirect contact. For example, large photos from home visits were hung on the walls of the kitchen, bringing employees closer to their customers. The Good Kitchen also began publishing a newsletter that included posts from kitchen employees, information about and pictures of new hires, and other important events such as employees’ birthdays and the birth of a grandchild. This gave the elderly a better understanding of what happened in the kitchen and communicated that there were real people standing in front of the stove who took pride in what they did. Once the transformation from Hospitable Food Services to The Good Kitchen was complete, the results spoke for themselves. Reorganizing the menu and improving the descriptions of the meals drove a 500% increase in meal orders in the first week alone. Within three months, the number of customers had increased from 650 to 700. One of the most important elements of the transformation has been the shift in employees’ perception of themselves and their work. Kitchen workers are now much more satisfied and motivated. As a result, customers are happier with their food. “If you have professional pride, you’ll also cook good food,” Anne Marie Nielsen, the director of The Good Kitchen, told us. “Good food has to come from the heart! This experience generated so much positive energy. We have received positive reactions from everywhere—from users and partners and colleagues in other municipalities.” Moreover, The Good Kitchen now receives many more unsolicited job applications as word of the improved reputation has spread. The Good Kitchen’s success was noticed outside of Holstebro as well. The Good Kitchen and Hatch & Bloom shared the Danish Design Prize for Service Design, as well as the Local Government Denmark Prize for Innovation in 2009. What Do We Take Away from the Good Kitchen Story? By identifying a public challenge to the health of seniors and a fiscal challenge to the state, and using an arsenal of design tools to address both, the Municipality of Holstebro dramatically improved the service experience and quality of life for both employees and customers. This project comes as close to providing a truly win-win solution as we are likely to find, transforming a vicious cycle of malnourished seniors, unhappy employees, and increased health care costs into a virtuous one with healthier, happier seniors (and employees) and improved costs to the state. Be willing to engage the entire system. It is worth noting that this chapter is as much about system design as it is about service design. It reminds us of a lesson that Peter Senge taught us long ago in The Fifth Discipline: Put the whole system in the room. In business, we have gotten much better about the customer part, but we still often neglect employees and communities. Design thinking gives us a detailed suggestion about what to do with the system once all parts of it are in the room: share the findings of the deep ethnographic exploration of the stakeholders we want to serve, build an aligned intent around making their lives better, and then invite everyone to derive insights, generate design criteria, and co-create solutions. If you use design thinking, you must realize that it might lead you to places you didn’t expect to end up. And if you have the courage to embrace that, you can go tremendously far and you can try out different methods and you can ask, ‘Do they work for me? Do they work for my organization?’ But that requires a certain level of courage and a willingness to change. If you’re not brave enough to face these consequences, and if you don’t have the mandate from your leaders, then it’s very difficult to do innovation. Innovation requires space—mental space and financial space and organizational space. Design feedback into the solution so that you won’t have to fix big problems so often. Why do we spend so much time trying to create dramatic, wrenching change? Usually because we ignored the signals that would have allowed us to adapt more gradually. If we build those signals into our design of the offering or service, the odds that we’ll see them before the crisis go way up. That is what those simple feedback cards do for The Good Kitchen. They create a seemingly mundane but very valuable ongoing conversation about daily hits and misses that helps employees get to know their stakeholders better along the way and greatly reduces the need for cataclysmic change later on. Appreciate the awesome power of ethnography. We sound like a broken record by this point. But if you take only one thing from this book, this should be it. The story of The Good Kitchen reveals more powerfully than any other why this is true. Most of us reading this chapter are not now elderly (despite what our children think). Most of us can’t recall the sweet pleasure of having strawberries only in summer. We cannot really know what it means to lose, one by one, the freedoms the young and healthy take for granted: to choose our food, to control our personal hygiene, to be able to have dinner with those we care about. Without ethnography, we will not know these things until it is too late to improve the lives of the elderly. We’ll throw strawberries on everything all year long, wasting their ability to conjure up memories of summers past. We will dictate meal choices that are economical or that make sense to us, and package them in servings of one so that they can only be eaten alone. Without the deep insights produced by ethnography, how many opportunities to do something truly special for an elderly person—something that probably costs little or no additional money—will we fail to see? We recall a Legal Aid attorney’s comments to us about the challenges that she and her colleagues faced in providing truly useful legal services to the poor: We are, and I will make a broad generalization here, ivory tower babies. We’re very privileged. We have telephones and good incomes. And we have transportation. We don’t face a lot of the problems that these clients are facing every day. And so we don’t understand what they go through. But at least design thinking gives us tools to help us try. This case study is an adapted version of a book chapter that has originally been published as “Solving Problems with Design Thinking: Ten Stories of What Works” . It is republished here by courtesy of the authors. Check out this video for "Municipality of Holstebro, Denmark > The Good Kitchen"
Did you learn something new or surprising? How good is the writing style of the author? I really appreciate the initiatives taken by ‘Hatch and Bloom’ team to care about the elderly population in Denmark. A heart-felt thanks to ‘Hatch and Bloom’s team for their diligent approach in impacting the lives of senior citizens. 1 At the periphery (e.g. via booking agencies or conducting workshops). 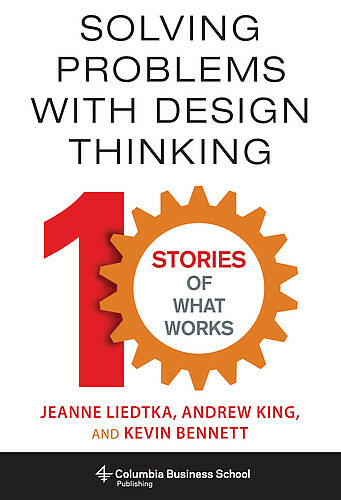 This story was republished from the book “Solving Problems with Design Thinking: Ten Stories of What Works” by kind permission of the publishers and authors.